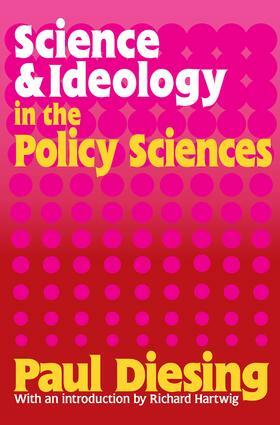 The purpose of this book is to examine how ideology operates--in the sense of influencing the conduct of inquiry--in the policy sciences, defined as economics, political science, and sociology. The author seeks to identify the main ideologies and show how each ideology produces a preference for certain problems, methods, and hypotheses; how it sensitizes scientists to certain phenomena and suggests certain interpretations of those phenomena; and how it closes off other phenomena and concepts from investigation and testing, or at least distorts that investigation. In this book, Diesing critically examines all the major schools of policy-related social thought from 1930 to 1975. He deals with Neoclassical Economics and its various applications, the Keynesians, the Systems Approach, the Schumpeter perspective, the Critical Intellectuals, the Pluralists, the J. K. Galbraith School, New Left Marxism, and the Ecological Paradigm of Schumacher and others. The world looks different if your perspective is that of a rational small businessman working in a society of hypothetical perfect competition, as opposed to that of a proletarian, looking up at your oppressors. Part One is descriptive and evaluative, considering each ideology in turn; Part Two considers the policy implications. "In 1982, Diesing published a remarkable book entitled Science and Ideology in the Policy Sciences. When I interviewed Diesing in Buffalo in the summer of 1984, he told me that to date, the publication had been reviewed in only two professional journals. I was astounded. Science & Ideology…was the best book I had read in a decade, and it related directly to all the policy sciences. The lack of professional response may partially reflect Diesing's disinterest in self-promotion, but beyond this is the 'community' problem. Scholars are recognized within disciplines, but there is only a tiny 'community of social science'. I consider this to be the most brilliant of Diesing's books. Like all of Diesing's works, it remains highly relevant today." --from the introduction by Richard Hartwig.